Root canal treatments are one of the most feared treatment types on dentistry. It contains drilling, removal of nerves from the tooth, strange noises and the worst, never ending anxiety whether the whole procedure will be able to avoid further pain of the tooth. The purpose of a root canal treatment is to remove the damaged tissues from the canal and to disinfect the spaces inside the tooth so that later on we can perform a filling and seal the root. After that a crown or other reconstruction is made to restore the original function of the tooth. It is often very problematic with to disinfect the canals entirely with conventional methods because the shape can be irregular. Therefore the root canal filling is not going to be 100% successful and later on the tooth can become tender again or even develop a new inflammation around the apex. In these cases we have to perform a re-treatment of the canal. A solution to these problems is the endo-microscope. This technology allows us to view the canals in a 20 times magnification. It also allows the operator to sit in an upright position and the patient can also lay more relaxed in the chair. With this device even the narrowest, curviest canals can be shaped and widened to the required size. No matter how small the source of the problem is, under such magnification the endodontist can eliminate almost every difficulty and seal the canal for further conservation. A good example is the 4th canal of the upper first molars that is present in almost 95% of cases. 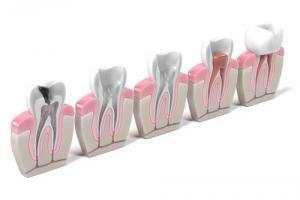 Nowadays we are aware of the uprising tendency of 4th canals in molars. Mostly it is very narrow and quite hard to locate. Upper molars are hard to reach in general and even more difficult to instrument since vision is severely compromised without any magnification. Using a microscope for these RCTs make the procedure much safer and more accurate than before. In conclusion, for complicated cases, hard to reach teeth it is risky to avoid the use of magnification, so it’s vise to choose microscope aided treatment in these cases. If the root canal treatment is not 100% successful, there is a great chance that the tooth will get a reinfection and the patient loses it in a few years. Then, replacing the missing tooth raises other problems (technical and financial as well) which could have been avoided with a thorough RCT. The term RCT is still a fearsome one for many people, most of our patients tend to have at least one bad experience about it. Many years ago there was no instrument that would have been capable of measuring the exact length of the canal, instead the patient was asked to give a sign if he or she felt any pain during the treatment. This was used as reference for measuring the working length. Fortunately today we have everything we need to make this procedure absolutely painless and precise. tissue, which are being removed during RCT. The procedure is performed under local anesthesia and is therefore painless, however if there is an acute inflammation, there might be mild pain due to the modified effect of the anesthetics. We only use high quality, modern equipment for this treatment. Our devices operate at a 97.5% certainty, therefore giving the maximum chance to save the affected tooth. RCTs are usually performed in one seat, but in certain cases there’s a need for postponement of the permanent filling. In cases like this the tooth gets filled with a temporary substance that calms the tooth and its surrounding tissues. The permanent filling is going to be made during the next appointment. Root canal treated teeth can be kept for many years but their resistance to load might be compromised compared to sound teeth. It’s recommended to check these teeth annually with an x-ray. Those teeth that cannot be root canal treated properly represent a focus and therefore need to be removed.